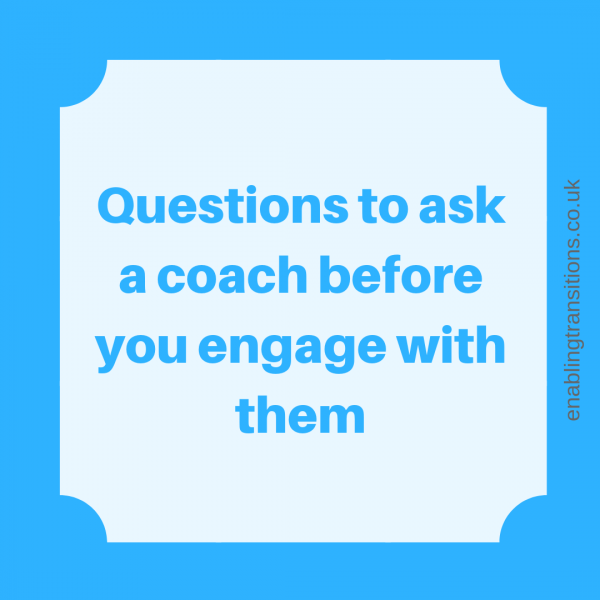 You have decided to engage with a coach but how do you go about choosing a coach. There are lots of coaches out there and there are poor coaches and good ones. Coaching is unregulated so anyone can call themselves a coach so how do you find a GOOD coach? Here are some questions to ask a coach before you decide to use their service. What qualification(s) have you got? There are loads of qualifications out there and it is difficult to know what is the crème de la crème of coaching. Generally anyone can be a coach. However a GOOD coach will have a coaching qualification and other training. NB. being a member of a coaching association does not mean your coach is well qualified. What tools do you have in your kitbag? -A GOOD coach will have a range of analysis tools in their kitbag and will use what is appropriate for the person. This could include an analysis of behaviour, EQ, MBTI, NLP, mindfulness and more. -An inexperienced coach will rely on a single model / theory for example an NLP coach relies on NLP and a mindfulness coach relies on mindfulness. What’s your experience as a full-time coach and pre being a full-time coach? -This can be to do with number of years practicing as a coach but much more. Be wary of coaches who tell you they have many years coaching as a manager in one company. That is a different type of coaching. A variety of sectors, companies and levels of coachee make up a GOOD coach. The experience with variety will have more versatility. What records do you keep? -This is important and linked to confidentiality so that you are aware of what exists about your coaching sessions. Coaches who don’t follow these principles give coaching a bad name. If you want to know about choosing the right coach for your organisation or for you, please contact me. I am passionate about coaching and coaching standards. Print article This entry was posted by Denise on September 30, 2018 at 9:25 pm, and is filed under Coaching. Follow any responses to this post through RSS 2.0. Both comments and pings are currently closed.